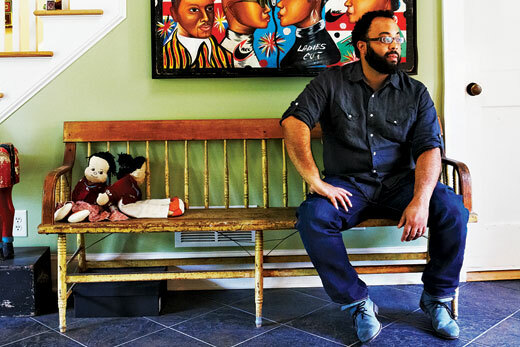 Kevin Young 's latest poetry collection, "Book of Hours," confronts themes of birth, death and rebirth. Photo by Melanie Dunea/CPi. 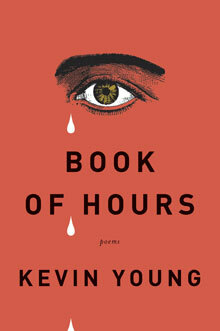 Kevin Young will give a reading of "Book of Hours" at 7 p.m. Monday, April 7 at the Carter Presidential Library and Museum Theater, 441 Freedom Parkway, Atlanta. This A Cappella Books event, co-sponsored by Emory's Department of English, is free and open to the public. Award-winning poet Kevin Young says he's never really finished writing a book until he can hold it in his hand and read from it, so in coming weeks, Emory's Atticus Haygood Professor of English and Creative Writing will be crisscrossing the country, bringing to completion his newly published volume, "Book of Hours." "Book of Hours" marks the 10th anniversary of the death of Young's father, and the intervening years saw the birth of his son, now seven. His latest collection confronts themes of birth, death and rebirth, moving between and beyond his life's milestone events. "These are poems that have been brewing for awhile," Young says. Young is teaching an advanced poetry workshop at Emory this spring, and his students are writing poems based on a busy roster of visiting writers this semester, including Pulitzer Prize-winners Tracy K. Smith, Paul Muldoon and Sharon Olds (coming as part of the Raymond Danowski Poetry Library Reading Series, curated by Young, on March 20). This past week students were writing elegies, "not just to people, but to things, places; whatever absence they wanted to confront." Young hopes they will produce poems of real weight that explore this longstanding tradition of poetry. His approach to teaching is a combination based on "reading and writing” and "showing students how to do it in an oblique way that is both sped up and intentional, but is also a good model, you hope." Young's models included Seamus Heaney, who taught him shortly before winning the Nobel Prize for Literature. As a teacher he taught him "how to live life as a poet, which I really appreciated." "I didn't grow up knowing poets," says Young, "so having a chance to study with someone who was writing about a world that was far away but not so very different from rural Louisiana where my parents are from was really a tremendous gift." What Young discovered, he says, is that poetry is "about the long haul, and finding the language to explain not just experience, but also history and a little bit of the future." Young is curator of the Raymond Danowski Poetry Library at Emory and the author of seven previous books of poetry, including "Ardency: A Chronicle of the Amistad Rebels," winner of a 2012 American Book Award, and "Jelly Roll," a finalist for the National Book Award. Young’s book "The Grey Album: On the Blackness of Blackness," won the Graywolf Nonfiction Prize, was a New York Times Notable Book and a finalist for the National Book Critics Circle Award for criticism, and won a PEN Open Book Award.